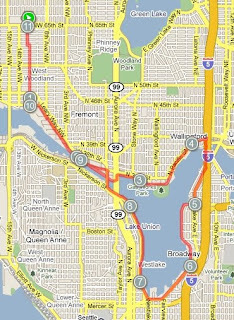 Ran our 10-miler this morning down to Fred Meyer, then along the BGT to the Fremont Bridge, and then over to the Cheshiahud trail around Lake Washington. Really nice morning -- trees still glorious, and the weather held (hooray for running outside!). Didn't feel particularly strong or fast, but things went pretty well. Still, my legs were tired at the end. I don't think I can continue to run 3 days in a row. Tomorrow another well-earned rest day.